We have been growing peppers, making sauce, and raising money for gardening projects in Detroit since 2013. 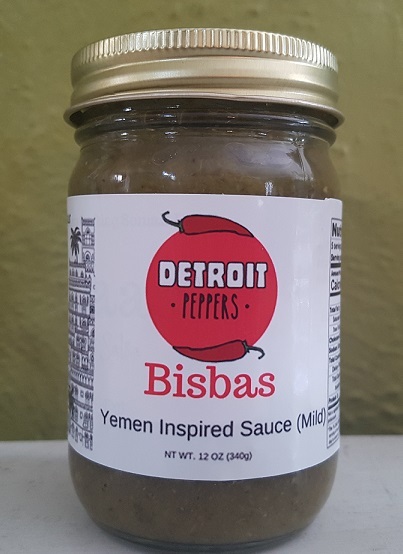 We currently sell a Yemen inspired sauce called Bisbas. It is made with all fresh ingredients and is delicious. It has a mild spiciness to it. We sell it to raise money and promote our gardening work in the community. Detroit Peppers started as an idea among a community of diverse leaders and turned into something so much bigger than one person. The idea was simple, "Let's start a garden." The idea was not profound, but over time that garden has led to thousands of pounds of fresh produce being grown, thousands of volunteer hours, thousands of conversations with people from many diverse backgrounds, and thousands of dollars being raised to support these projects. We took on the name Detroit Peppers, because every year we attempt to grow every variety of pepper we can find in the gardens we work. The projects we partner are owned by other community organizations. We simply come alongside their vision as a support. Many residents in our community are 1st generation immigrants from Bangladesh and Yemen and peppers are very common in their cultural dishes. We currently support the Sylhet Farm in Detroit owned by the Detroit Hope Center. The farm sits in the heart of a cultural district recognized by the State of Michigan as Banglatown. It is called Banglatown as it is home to thousands of immigrants from Bangladesh. It is named Sylhet after a region in Bangladesh where a large number of Bangladeshi people in the Detroit area have immigrated. We have helped plan the farm, recruit volunteers, and raise money to build it out. Detroit Peppers has a small section of the farm where we grow products to sell through the various channels. *These numbers are cumulative since 2013 and updated annually every December. Gardening on highly visible properties in the community naturally draws out people’s curiosity. Recruiting a team of volunteers brings even more neighbors out who want to know what we are doing. We started slow with the help of advocates, but now people in the community come out regularly to talk, play, eat, reflect, pick weeds, or water. This is not an extensive list by any means. In the summer the project sites we help garden are thriving with activity, and this is only increasing with time. If you want a unique experience, come volunteer on one of our garden sites. Most groups come in the summer and fundraise $500-$1,500 to go towards a garden project. Contact us if you have a group interested in volunteering.